Linkin Park have announced their new album The Hunting Party, will be released on June 17th. 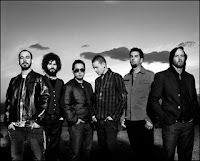 The band's latest full-length contains 12 tracks and is mixed by member Mike Shinoda. Don't forget, the band will be heading out on the "Carnivores Tour" this summer with Thirty Seconds To Mars and AFI. Dates and ticket information can be found here.